My Starcool III kicked the 40 amp manual reset circuit breaker yesterday and cut the system off. I pushed in the little button, and the system fired up again, however, when I walked around the van, I noticed that the Auxillary Condenser Fan (located outside the van, under the driver's seat) was NOT running. I pulled the manual up, and see where the Aux condenser fan is fused with a 15 amp 12v fuse located on the fuse relay plate. Pulling up the rear seat, I don't see where this fuse is (??) ... I have a 5 amp & three 20 amp fuses, but I don't see a 15 anywhere. Am I missing something here, or is this fuse in another location? I snapped a quick shot of the fuses on the relay plate. Thanks for any help or advice!? I am not sure what manual you are talking about, I don't believe the general sportsmobile manual deals with StarcoolIII. You can find the starcoolIII manuals at this location. While this picture is for something else it identifies the fuses, and they are as you have installed. 12 Aux Condenser is 2nd fuse down or top 20 amp fuse. Got it, sorry for my confusion. 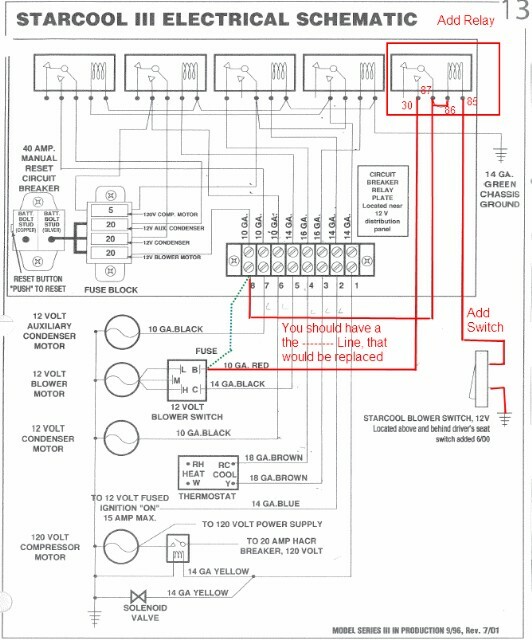 I believe that is referencing to the 15 amp fuse for the 12 volt ignition on circuit (terminal 2 on panel) Might be a fuse where they attach , or they rely on it being fused by ford. Might be something attached up by steering column. Just wanted to close this thread for future searches - I spoke w/ Chad @ Sportsmobile Huntington - he noted that the separate fuse for the aux fan shown in the Starcool III manual doesn't exist. It's fused into one of the 3 20 amp fuses on the relay board. That's very common (seized fan). Best to replace both while you are it as long as you are ordering one. Seized fans will often trip the breaker or blow a fuse (or both) due to the high resistance.